I am not sure how to go about doing the descending exercise shown in the above video. Am I expected to descend from falsetto or regular head voice? My falsetto only comfortably goes as high as a C5 (tenor high c) or C#5 on a good day....and only if warmed up....or maybe a D5 if REALLY warmed up but it's hit or miss. Am I only supposed to start this exercise from regular connected head voice (and not a disconnected falsetto) on notes that I can comfortably reached? If so, then maybe that would mean I should only start it from a G4 or G#4 or maybe an A4 on a good day? If I am actually expected to start in falsetto, on, say, a C5 or C#5, then I'm not seeing how this would benefit me. For me, I've just never found singing a descending scale (or any scale for that matter) in disconnected falsetto to do anything (for me) toward increasing the range of a normal connected head voice. I've also never found a way to turn my disconnected falsetto into anything other than what it currently is....which is a breathy falsetto. To me it just seems there is no way to strengthen a disconnected falsetto. To me, it just seems that my disconnected falsetto doesn't lead me anywhere in terms of being able to strengthen that falsetto or blend it with anything. The only thing I can potentially blend with chest is a connected normal head voice, but that is not connected to falsetto. And the only thing that ever improved the range of my regular head voice is to gradually work my head voice higher (sing songs gradually higher) rather than try to work down from falsetto. There is an audible click (or sudden flip...at some point), when descending from falsetto to a normal voice, which can be disguised by singing softly but it's there in full force (ANNOYING loud flip) at a normal volume. That's been my experience.﻿ The only thing that ever seemed to work for me for expanding my upper range of a regular head voice is to sing songs and/or exercises that reach to the top of my normal range, and gradually work my way higher over time. But that hasn't resulted in an incredible range at all. I'm currently limited to an A4 or Bb4 when practicing at home, but would never currently sing songs publicly that go that high. I will add that there is no way I can get any kind of "ping" when singing in falsetto. I can only get a "ping" when singing in a normal head voice, but my normal head voice is limited in range, as discussed in the previous message. Yes. Start the descending scale only from the highest note you can comfortably sing, and don't sing it overly loud. Do try to give it some bright timbre, and do try to make it less breathy than falsetto by using a bit of cord closure. Support the note by cutting back the air and pushing down a bit on your diaphragm. Definitions vary a lot from one school of thought to another. If I'm understanding correctly, I should start from the highest regular head voice note, softly, but not from a disconnected falsetto. Thanks. I'm not exactly sure what you mean by "a disconnected falsetto". I think we have come through different schools of vocal terminology. Generally, at KTVA, when we refer to "falsetto" it's Head Voice, but with poor cord closure. So there is a lot of air in the sound; It's hooty-flutey-sounding. Falsetto, because of the lack of cord closure, is a weaker, airy version of head voice. Normal head voice should have cord closure. Not an airy sound. It's lighter-sounding than chest voice, but in the head voice register. For many males, it will be above Eb4. Some males go into head voice lower, others higher, but there is a register break from the secondo passaggio into head voice. If you separate the vocal cords and allow air to infiltrate the sound, it becomes airy falsetto. With cord closure, you can add timbre and brightness to the head voice sound. This will more seamlessly match up to the sound of the chest voice at the passaggio. Connecting most often refers to going through the passaggio without a vocal break, or "yodel". You can connect to falsetto or to head voice without a break... but because of the hootiness of falsetto, it's more obvious that you just went through a register change. Ken sometimes refers to head voice as "falsetto" because a large portion of vocal instructors and students refer to anything above the secondo passaggio as "Falsetto" rather than head voice. It becomes confusing to mix terminolgies from one school of thought to another. Two individuals can be having a conversation of which two very different impressions are formed from the same words. Within KTVA, falsetto is the airy, hooty sound of a female soprano. Head voice is a more timbral sound and would be closer to the sound of Robert Plant's high notes on a Led Zeppelin song. So, yes, you would want to start at the highest head voice notes you can sustain, avoiding excess air by applying cord closure and a bright tone, and do descending scales. Doing these for several repetitions daily can build strength in this range. Over a period of time, you can probably start at the next note higher in the scale, and later even higher. That's how we build our head voice range and stamina. Similar to what you said about starting a high song a few notes lower and graduating until you can sing it in the original key. Use diaphragmatic support to reduce the force of the air pressure on your cords. Thanks. When warmed up I will start at around a G#4 (or A4 on a good day) and descend. If I were to start any higher, then it would either be a strain to keep cord closure, or I'd have to let my cords NOT have enough closure and it would be airy (like Mick Jagger singing emotional rescue). I assume you mean I should not let it start out airy like that and just stick with the notes that I can get closure without straining. Would there ever be any value to starting out airy (like Mick Jagger in emotional rescue) on a high note like a tenor high C, and then descending into a regular head voice on notes that are lower in pitch? I've tried that before but it didn't seem to do anything for me in terms of extending the range of my regular head voice (that has closure). I guess that's why I should stick to regular head voice with closure even if the starting pitch is lower, right? There is "some" value to singing high in the airy, flutey tones, simply because you are doing the "cord-tensioning" required to get to the notes, and that part does have value. The flip side of that is that excessive air dries out the cords, and takes away their resilience (ability to stretch in the first place), so it's kind of like you're durned if you do and durned if you don't. So, yeah. Doing the exercises with closure and timbre is more beneficial. At KTVA, a big part of what we learn to do (safely) is "stretching chest voice" above the secondo passaggio. We also later learn to "stretch head voice" both below the secondo passaggio and above where we previously would top-out our head voice. So we stretch head voice in both directions. You can also stretch chest voice lower than your present limits, but that's another conversation. 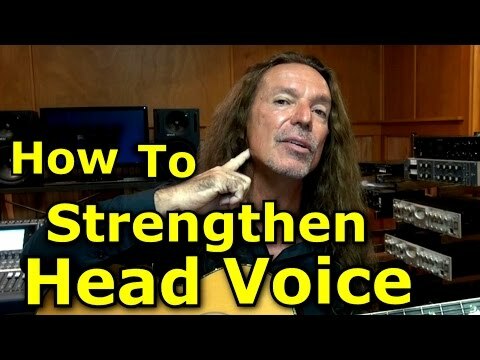 So, my point is that exercises like this can be used to grow your head voice, or chest voice beyond the commonly-believed limitations that many vocalists have been led to feel condemned to. Not that it's super-easy, or that instantaneous results happen in expanding your vocal range.